The Allosaurus is called "The Wolf of the Jurassic"
Are you seeking all things Allosaurus? Click here to go to Amazon to find all the other things your heart desires as well. "Allosaurus" is Latin for "other lizard." The Allosaur was the Apex Predator of the Jurassic Period. This simply means that if you wanted to go to see the "Godfather of the Jurassic" you'd go to the Allosaur. And he got all things done. Like, for instance, eating. At thirty-six feet in length and approximately two tons "Big Al" was an eating machine with teeth 3-4"long. Of course this was quite small when compared with some of what he wanted to eat- Apatosaurs, Diplodocus', Brachiosaurus and other huge Sauropods- ten and more times the size of an Allosaur. "Meals on Treetrunks." This problem was readily redressed by the simple solution of "ganging-up." I have really liked the Allosaurs since the first two that I saw at the American Museum of Natural History back in 1951. 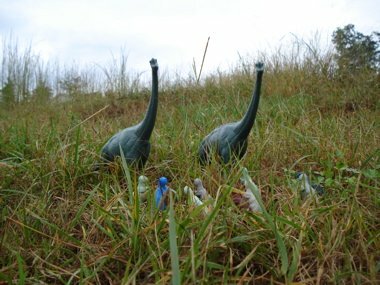 They, of course, were skeletons, set up stalking a Brontosaurus (as it was called then) skeleton. I was stricken with the beauty of these creatures and the energy still seen in their skeletal remains. "Allosaurus" means "other reptile", the one who came to dinner. (At least he comes with take-out.) The Allosaurus is also a very popular (carnivorous) Dinosaur toy, second only to "the king", the mighty Tyrannosaurus Rex. Since the mid-nineties, when toy makers apparently began to realize that Dinosaurs sell, there have been a variety of different 'toy takes' on the Allosaur. Pretty much anybody with a three-clawed forehand can be considered as an Allosaur, if not obviously someone else. The Walking with Dinosaurs franchise has produced an "up close and personal" biography of a hard-luck Allosaur known as "Big Al". I will be adding to this list as I come across other Allosaurus. You are welcome to submit your own. Allosaurus NOT Your Bag-osaur? 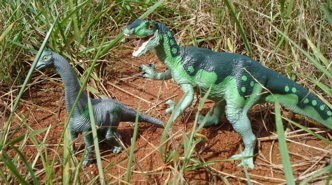 Try our Home Page, or try our Dino-toys companies page and for additional knowledge on Allosaurs in general, here is a link to Wikipedia.